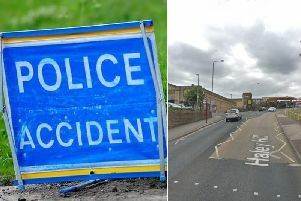 A senior watchdog official investigating the death of a Huddersfield man shot by police near the M62 said today that there are “many unanswered questions” about the incident. The Independent Police Complaints Commission says none of the police officers present during the death of Yassar Yaqub were wearing body cameras and so far no “relevant CCTV footage” has been found. Mourning friends and family hold a vigil at Jct 24 of the M62. A post-mortem examination carried out yesterday found that the 28-year-old father-of-two died of gunshot wounds. An inquest into Mr Yaqub’s death will open tomorrow at Bradford Coroner’s Court, where brief details of the circumstances are expected to be released before senior coroner Martin Fleming releases Mr Yaqub’s body for a funeral to take place. Mr Yaqub was shot by a West Yorkshire Police firearms officer at around 6pm on Monday after two vehicles were stopped on a slip road off junction 24 of the M62 near Huddersfield during a planned police operation. The IPCC said its investigators are continuing to gather information and build a picture of the events that unfolded. Investigators have conducted house to house enquiries in the local area. I would like to reassure the local and wider community that this will be a thorough and detailed independent investigation. According to the watchdog, the two vehicles stopped by police on the sliproad were a white Volkswagen Scirocco and a white Audi in which Mr Yaqub was travelling. Police officers involved in the incident were travelling in four unmarked police vehicles. The IPCC said in a statement: “A non-police issue firearm, found in the Audi, was secured in the presence of IPCC investigators at the scene and is undergoing ballistics and forensic testing. IPCC Commissioner Derrick Campbell said: “I would like to reassure the local and wider community that this will be a thorough and detailed independent investigation. “We will be carefully examining all the circumstances leading up to Mr Yaqub’s death, including the planning of the police operation, and the actions of the officers involved that evening. “I am, of course, aware there are many unanswered questions but I would urge patience at this time and that people allow our investigation to run its course. “If anyone witnessed events who has not yet come forward we would be grateful to hear from them. Any witnesses to the incident are urged to contact the IPCC either by email at M62incident@ipcc.gsi.gov.uk or telephone on 0800 096 9072.